Annual global IP traffic will pass the zettabyte (1000 exabytes) threshold by the end of 2016, and will reach 2 zettabytes per year by 2019. By 2016, global IP traffic will reach 1.1 zettabytes per year, or 88.4 exabytes (nearly one billion gigabytes) per month, and by 2019, global IP traffic will reach 2.0 zettabytes per year, or 168 exabytes per month. Globally, devices and connections (11.5 percent CAGR) are growing faster than both the population (1.1 percent CAGR) and Internet users (6.9 percent CAGR). This trend is accelerating the increase in the average number of devices and connections per household and per Internet user. Each year, various new devices in different form factors with increased capabilities and intelligence are introduced and adopted in the market. A growing number of M2M applications, such as smart meters, video surveillance, healthcare monitoring, transportation, and package or asset tracking, also are causing connection growth. By 2019, M2M connections will be 43 percent of the total devices and connections. By 2019, the consumer share of the total devices, including both fixed and mobile devices, will be 79 percent, with business claiming the remaining 21 percent. Consumer share will grow slightly more slowly, at 11 percent CAGR, relative to the business segment, which will grow at 13.7 percent CAGR. For more details about the growth in devices and connections in residential, consumer mobile, and business segments, refer to the Cisco VNI Service Adoption Forecast, 2014–2019. The transition from an IPv4 environment to an IPv6 environment is making excellent progress, with increases in IPv6 device capabilities, content enablement, and operators implementing IPv6 in their networks. These developments are particularly important because Asia, Europe and Latin America have already exhausted their IPv4 allotments, and North America is expected to exhaust its allotment this summer and Africa by 2019. Globally, 81 percent of smartphones and tablets will be IPv6-capable by 2019, up from 56 percent in 2014. Globally, there will be 4.5 billion IPv6-capable smartphones and tablets by 2019, up from 1.4 billion in 2014. By 2019, 21 percent of M2M connections will be IPv6-capable, reaching 2.2 billion, a 64 percent compound annual growth rate. According to the World IPv6 Launch Organization in May 2015, fixed and mobile network operators worldwide are deploying IPv6 and starting to report notable IPv6 traffic generation. KDDI reported nearly18 percent, Romania’s RCS & RDS reported nearly 20 percent, France’s Free Telecom reported 29 percent, Comcast reported 37 percent, AT&T reported 52 percent, and Verizon Wireless reported 69 percent. According to Google, in May 2015 the percentage of users who access Google through IPv6 is about 6 percent. 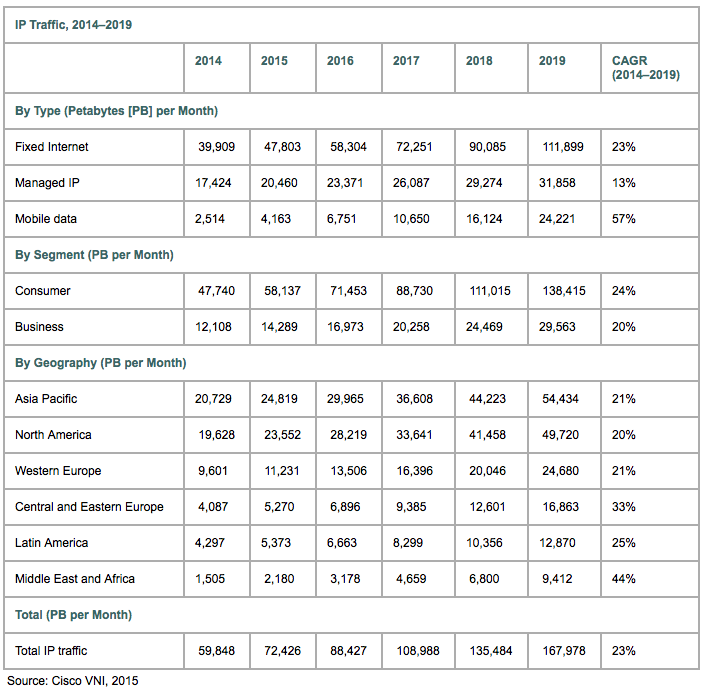 Akamai reported threefold growth in its IPv6 traffic volume worldwide since last year, with about 900,000 IPv6 hits per second in May 2015, compared to nearly 270,000 IPv6 hits per second in May 2014. Amid these industry developments, this year’s VNI forecast is undertaking an effort to estimate the potential IPv6 network traffic that could be generated if a percentage of IPv6-capable devices become actively connected to an IPv6 network, given the estimated global average for monthly traffic per device type. Looking to 2019, if 60 percent of IPv6-capable devices are actively connected to an IPv6 network, the forecast estimates that globally IPv6 traffic would amount to 45.7 exabytes per month, or 34 percent of total Internet traffic.